FSB BYRD -- Bravo Company, 2nd Battalion, 14th Infantry, "Golden Dragons," with accurate artillery support, recently turned back an NVA assault here and inflicted heavy casualties on the attackers, killing five. "At about midnight, we began to take a heavy barrage of mortar and small arms fire from three sides," said First Lieutenant Sam Hargrove, of Buffalo, N.Y., the company's forward observer. "It seemed like they were using our radio antenna for an aiming point." Charlie Battery, 2nd Battalion, 77th Artillery, quickly responded by pumping 105mm rounds directly into a nearby woodline. "We couldn't see where they were exactly," said Private First Class Fred Sundermier, of Palmyra, N.J., "but from the firing we knew they were real close." Although enemy fire was heavy, the GIs stayed cool. 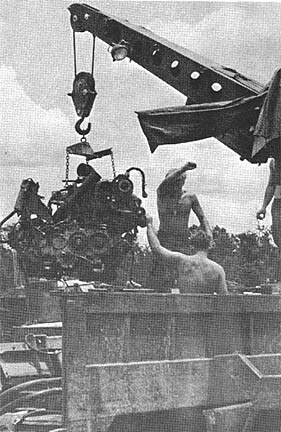 Specialist 4 Terry Groud, of Jay, Okla., and Private First Class Tom Heavilin, from Saybrook, Ill., had to dismantle two M-60s during the intense combat in order to make one workable. They then shredded the woodline with lead. 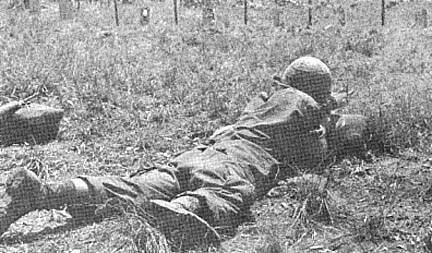 Meanwhile, Sergeant Terry Zych, Plymouth, N.H., was busy dropping rounds into a mortar tube when a dud shell cut through the RPG screen and landed near him. "I dropped in the mortar rounds twice as fast after that," said Zych. "Some snipers crawled to within a hundred meters of us but we messed them up with some M-79 rounds," said Private First Class Greg Stitt, of Salt Lake City. Evidently realizing further action would be futile, the enemy withdrew. A recon of the area later revealed the enemy's intentions. In a nearby trench, matted down grass indicated that a force of about 35 NVA had been about to make a dash for the wire. It never came off because the American fire had kept them pinned down. "There were probably about 100 NVA who must have thought they could take us," said Intelligence Officer, Captain Bennett Jones. "Arty did a fantastic job," Jones added. "Those guys really put the max on them, even with all the incoming." BOI LOI WOODS -- "I turned around and through the darkness I could see two NVA a few meters away preparing to shoot Doc. I didn't have time to chamber a round, so I ran and dove at them while hollering for Doc to get away." Quick thinking and action by Second Lieutenant James W. Roy, from Newark, Del., of Bravo Battery, 2nd Battalion, 77th Artillery, working as forward observer for Alfa Company, 2nd Battalion, 27th Infantry, saved the life of Medic, Private First Class William Braun of St. Louis. "It was only my second night in the field and I was nervous," said Roy. "I was with the CP (Command Post) group and we had set up an ambush patrol in the Boi Lois. We had just gotten set up when it happened." "It was our shift to sleep, but I was a little tense, so I stayed awake. Doc was sleeping a few meters to my rear when two NVA stumbled upon him," Roy recollects. "When I saw them drop to their knees and take aim on Doc, I knew I had to do something fast and tackling them seemed the best choice at the time," he added. It turned out to be a wise decision as Roy dove head-first through a clump of small trees and bowled the two enemy to the ground in football linebacker fashion. 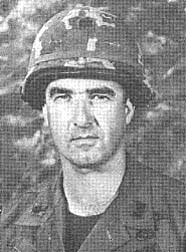 "I heard Lieutenant Roy holler and as I looked up I saw him land on the NVA and tumble to the ground," Braun recounted. "One of their AK-47s smacked me on the head as we all hit the ground," Roy said. "Then it just turned into a free-swinging fist-fight." One of the enemy managed to escape, but Roy succeeded in subduing the other after a lengthy battle. "I had him in a hammerlock with one of my arms and grabbed his other arm with my free hand," said Roy. "A few times he managed to get his arm free and started reaching for his shirt. I thought he might have had a pistol, so I hit him in the mouth every time he got his arm loose. As it turned out, he had two Chi-Com grenades in his shirt, but he never got a chance to use them." "Being an artilleryman, I never expected to have such close contact with the enemy, especially after being here only two days," he said. "I'm just glad that I hit them squarely with my tackle so they couldn't fire at Doc." FSB SWORD -- For one 25th Division infantryman, making containers for artillery powder charges back in the world was a "Family Affair." Before entering the service, Specialist 4 Harold Olsen of the 2nd Battalion (Mech), 22nd Infantry, worked at the Conco Engineering Company in his home town of Mendota, Ill. The company builds containers to protect powder charges for artillery rounds. "The funny thing about it is that practically my whole family works there," said Olsen, "four aunts, one uncle, two cousins, my mom and I." Some of the Olsens man the company's assembly line. "One of my aunts welds the seam of the canisters. My uncle and two other aunts spot weld them. My mom welds the outer ring of the canisters, and another aunt pressurizes the lids to the canisters," continued Olsen. Now at the Triple Deuce forward position, Olsen often sees his work put to use. One night, for example, his battalion came under enemy attack. With the help of an artillery battery the enemy was soon turned away. "Little did I think back then that the ammo my family helps make would one day save my life," Olsen said. 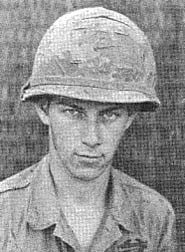 CU CHI -- Specialist 4 John P. Schaad has been added to the Tropic Lightning Combat Honor Roll. SP4 Schaad distinguished himself by heroic actions on May 28, serving with Company D, 4th Battalion, 9th Infantry. 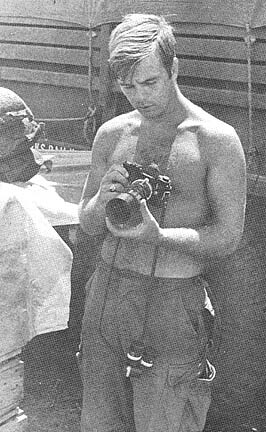 While on a reconnaissance operation, elements of his company came under attack from a large enemy force. In the initial contact, all unit leaders became casualties. Responding to the absence of leadership, SP4 Schaad organized efforts to remove the wounded. Without regard for his own safety, SP4 Schaad exposed himself to a hail of small arms fire, automatic weapons, and rocket propelled grenade fire as he moved through the contact area, distributing ammunition and encouraging his men. When evacuation of the wounded proved almost impossible because of the intense enemy fire, SP4 Schaad suggested the successful idea of using a smoke screen to provide cover for his wounded comrades as they were evacuated. When they light your fire. "The problem and hazard of fires is always present, and the wet season is no exception," reports civilian Ralph C. Neves, of Wilmington, Ill., division safety director. There is an ever present concern for the chance of a fire flaring up in the living quarters at any base camp, because of extremely flammable building materials and close quarters. No precaution should be over looked. The use of bamboo matting, blankets, cloth and other flammable or smoke producing materials as wall coverings and dividers, besides being against Army Regulation 420-90, para 35b, is also extremely hazardous in so far as fire is concerned. Even though many articles may not burn they still may produce smoke which could cause suffocation and could smolder spreading flame flammable articles, causing a major fire. Though few recently reported fires can be directly attributed to flammable wall mats and dividers, it is known that they increase the spread of a fire once started. It is also known that the prime causes of most fires in living quarters are overloaded electrical circuits and smoking in bed. Recently a serviceman on R&R died from smoke suffocation when he fell asleep with a cigarette in his hand. But the immediate concern is where fire affects the most lives - in living quarters at base camps. If precautions are taken, fires will be kept to a minimum. It is easier to prevent a fire than to put one out. WEST POINT GRAD - Lieutenant Colonel Forrest T. Gay III, has assumed command of the 65th Engineer Battalion. LTC Gay comes to the division from the U.S. Strike Command, MacDill AFB, Fla. This is his second tour in Vietnam. KATUM - When a man's home is destroyed and his wife and children are hungry, what can he do? The problem was common to Cambodians living near here and the First Brigade civic action section set out to help solve it by moving operations lock, stock and barrel across the border. The section traveled on the heels of maneuver elements setting up MEDCAPS and distributing captured enemy rice, corn oil, flour, wheat and oats among Cambodians. "Initially, they (the Cambodians) were wary of us," 1st Lieutenant Thomas Johnson, New York, said. "But soon they were amazingly grateful for our help." Assisted by the 2nd Civic Action Unit the brigade section set up a program to provide material and guidance to Cambodians who lost property because of the fighting and tried to get them back on their feet again. They also tackled the refugee problem. "Daily 190 to 250 people were returned to Cambodia," Johnson said. "Most were taken to Memot because it's most centralized." 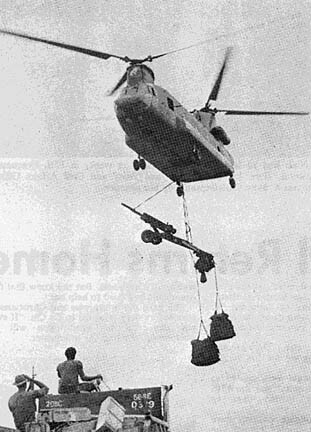 Other were delivered directly to their homes if a convoy was headed in the right direction. "It's very easy for members of families to get separated. We did our best to prevent this sort of thing," Johnson said. At the same time the section conducted regular psychological operations. 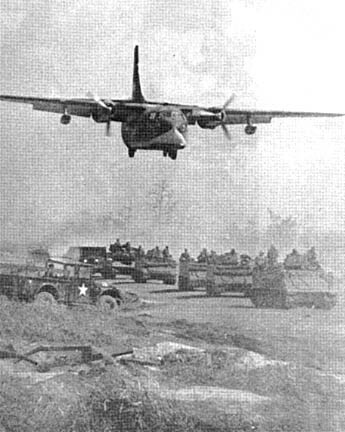 Chieu-Hoi (Open Arms) leaflets were dropped from aircraft and loud speaker teams operating with maneuver elements made broadcasts during ground operations. "We emphasized that the enemy was hurting for supplies and tried to create doubt and insecurity and weaken morale among them," Johnson said. Ralliers were interviewed and asked to make statements that could be used in making new leaflets and recordings. They testified to being well treated by the allies. "It's of utmost importance to keep the civilian population informed," Johnson said. "We used posters, leaflets and broadcasts for that purpose, too." "There isn't any justifiable criteria for evaluating our work because we're dealing with men's minds," Johnson said. "About the most tangible thing we have are the GIs returning from the field carrying those delicious looking pineapples. More than likely each one was a present from a villager." "Claymore", "Didi", "2/12", "Boom Boom", "Melon Head", "Trip" "Ranger", "Faith", "Bush", "Dooper", "Maurice", "Speed" "Cool Breeze", "Zero", "Red Baron", and "Handset." The canine "friendlies" are simple in their tastes and live in relative comfort on C-rations and table scrapes. What's more they are easy to get along with. As for the war, they couldn't care less. 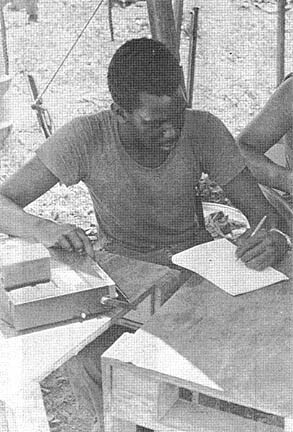 CU CHI - Wetting the whistle of the 65th Engineers is the job of Sergeant Jackie Grass, Locust Grove, Okla., and the men of the battalion logistics section. Each day Grass and his crew obtain, purify and deliver up to 40,000 gallons of water to the engineer troops. "In the field we pump the water from rivers and streams into 1,500 gallon van-mounted water purification units," Grass said. "It's filtered there." "Then, using a highly technical system and variety of chemicals, the water is cleaned of bacteria, color, taste and odor. This system produces from 9,000 to 10,000 gallons of water per day." Back in the base camp the engineers who man the water point go through the same process but their purification unit is housed in a permanent water shed. It purifies about 1,500 gallons of water per hour for 16 hours each day. The water is pumped directly to various units in the rear area. "Wherever our men go, we're not far behind," Grass said. "Water is as important and necessary to the soldier in the field as his weapon." THIRD TOUR -- Colonel Joseph R. Ulatoski becomes commander of 2nd Brigade. 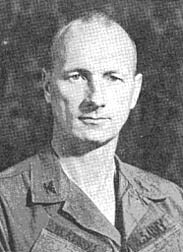 THIEN NGON - Making his third tour to Vietnam, Colonel Joseph R. Ulatoski recently took command of Tropic Lightning's 2d Brigade. Colonel Ulatoski, of Stamford, Conn., assumed command from Colonel Waldon Williams, of Alexandria, Va., who has returned to the 3rd Brigade, 9th Infantry Division. 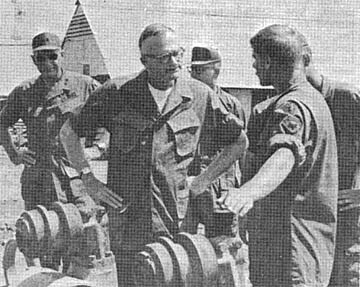 On his first tour in 1964-65 Colonel Utaloski was G-3 advisor from the 2nd Vietnam Corps. He came back again to assume command of the 1st Division's 2nd Battalion, 16th Infantry in July of 1967. Prior to assuming command of the Second Brigade, Colonel Ulatoski was military assistant to the Under Secretary of the Army. FSB BYRD - An enemy ambush failed to stop a determined "Golden Dragon" resupply convoy recently as it made it's way to Fire Support Base Byrd. The seven vehicle convoy from the 2nd Battalion, 14th Infantry, was passing thick woods near a narrow road when the enemy opened up with rocket propelled grenades (RPGs) and small arms fire. Specialist 4 Steve Cramer was driving a deuce-and-a-half loaded with ammunition for Charlie Battery, 2nd Battalion, 77th Artillery. "All of a sudden there was a huge explosion near the truck and I almost swerved off the road," Cramer said. "I down-shifted and put my foot to the floor because I didn't want the ammo to be a sitting duck." "I was in a jeep up ahead and after the explosion we began to receive small arms fire from the woodline but continued to roll at top speed," added Charlie Battery First Sergeant, Richard Collins. The entire convoy made it to Byrd intact, although not without some damage. The ammo truck, for instance, sustained numerous shrapnel holes, five flat tires, and a punctured gas tank. But, thanks to a quick-thinking, driver, it kept rolling and no one was injured. 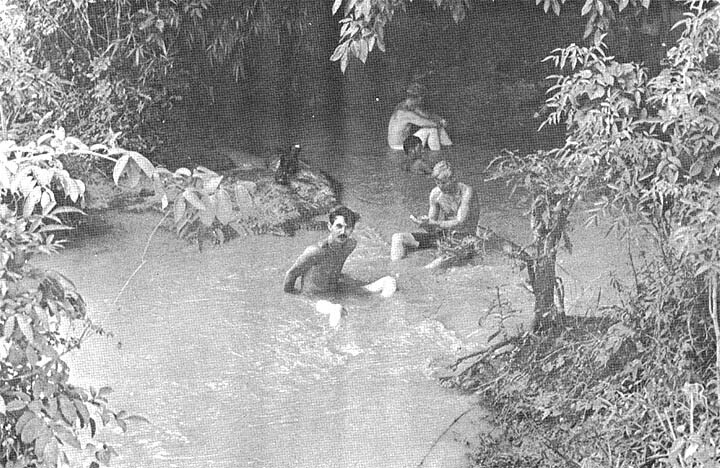 CU CHI -- Marriage on a Hawaiian R&R is a great idea, but for Specialist 4 John Yohler, an operations assistant with Headquarters and Headquarters Battery, 2nd Battalion, 77th Artillery, it was a harrowing experience he could sell as a Hollywood movie script. "My fiancee and I had originally planned to marry before I came over here, but decided against it," relates Yohler of Marion, Ind., "In our letters, we discussed the possibility of getting married in May while on Hawaiian R&R. "I wrote to a priest, Father Henry Sabog, at the Cathedral of Our Lady of Peace in Honolulu, and he replied that he would be happy to perform the ceremony." Yohler's fiancée, Miss Susan Dawson of Indianapolis, arrived in Hawaii two days early to make all the final arrangements. That's when Yohler's troubles started. "Problems began when my plane was delayed for five hours in Guam," recalls Yohler, "We had planned to have the wedding late that afternoon, May 13th. All I could think of while waiting for the plane was that the situation was hopeless. I figured we would have to wait another day or two." What the nervous bridegroom didn't know was that Father Sabog had been called to another island for 30 days on emergency. Miss Dawson made a quick change of plans with the Monsignor of the Cathedral, who said he would perform the ceremony if Yohler could be there by 6 p.m. that evening. The young bride-to-be contacted friends on the island to be witnesses and informed them of the change of plans. Yohler arrived at the R&R Center at Ft. DeRussy at 5:30 p.m. -- in time to discover that the marriage license bureau had closed at 4 p.m.
"The Chaplain at the R&R Center told us that there was a lady in town authorized to issue licenses, so we rushed over to her home. She was about to leave for a meeting and had a pot of beans cooking on the stove, which she was going to take with her. "She was worried about her beans and we were worried about our wedding. Finally we worked it out and she issued us a license. "Then we drove, to the Church and found no one in the office because it was after 6 p.m. In a few minutes, we found Father Albert Meinsinger in another part of the building. He told us that the Monsignor had asked him to marry us since the Monsignor was busy," Yohler continued. "But the witnesses had left, so we were still in a bind. We drove around looking, but couldn't find them." John and Sue returned to the church, and when at 8 p.m. the witnesses came back, the vows were finally exchanged. "It seemed like a nightmare at the time, but after it was over, we all had to laugh about it," recounted the groom. "They say that your Wedding day is one of the most meaningful and exciting days of your life, but that is an understatement for Sue and I." VIETNAM - At some time or another during his tour, the average GI in Vietnam realizes that something about him has undergone a change -- one much deeper than his dirt-embedded tan or sun-bleached hair. The change is in outlook. More specifically, in his ability to cope with everyday difficulties in Vietnam. The "new guy" in country with his pale skin, new jungle fatigues, and stateside airs becomes hardened both in attitude and appearance. The veterans, whether they have two or eleven months in country, seem to share an attitude best typified by the often repeated claim, "It don't mean nothing." Whatever the problem - whether it be the loss of a poncho liner, sleeping in the rain or receiving a "Dear John" letter -- it can usually be rationalized with, "It don't mean nothing." What is there in this grammatically incorrect phrase that makes it so meaningful? Possibly it's the acceptance of hardship in the realization that in less than a year this will all seem a bad dream. THIEN NGON -- Two NVA who came calling on an ALFA company 1st Battalion, 27th Infantry day lager site near here recently, were quickly met at the gate by an "unwelcoming" committee. "We were just sitting there when these two NVA walked around the corner and stopped about ten feet from us. One was reading something, and when they looked up they were as surprised as we were," recalled Specialist 4 Agapito Martinez, of Brownsville, Tex. Recovering from their surprise, Specialists 4 Josue Sallas, of Puerto Rico, and Jerry James, of Oklahoma City, Okla., were the first to engage the enemy soldiers, killing one. A subsequent search of the area turned up one RPG rocket propelled grenade launcher, three B-40 rockets with extensions and some vegetables. FSB CROOK - "Gun bunny, yeh, same-same new guy; it's the first step on the gun." This is the way gun bunny Private First Class Randy Culwell of Los Angeles explains it. PFC Culwell is a member of Alfa Company, 1st Battalion, 8th Field Artillery, "Automatic Eighth," and he works on a 105mm Howitzer. 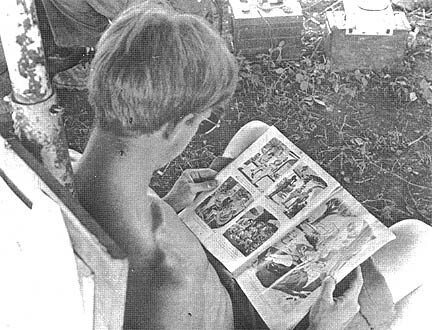 According to Culwell, when an EM comes to Vietnam with an Artillery MOS, he usually starts out as a gun bunny. From there, he can work his way up on the gun and, if he's good enough, he'll make "number one man." A gun bunny fills sand bags and humps ammo. "As many times as we move," Culwell says, "It gets to be a pretty busy job and pretty tiring. "Each time we move, we have to build two ammo bunkers and one personnel bunker. Everything must have two layers of sandbags, and the splash wall must be six or seven bags high." After gun bunny, the next step on the line is cutting charges. Each artillery round has a maximum amount of charges on it and some have to be removed, based on the calculations for the desired range of that round. "From there," Culwell explains," you start setting fuses on the rounds, then if you're doing a good job, you'll progress to 'number one man' -- the guy who does the actual loading." As the gun is being prepared for fire, the professionals take over. The assistant gunner sets the quadrant, determining the range. The gunner sets the deflection, aiming the gun to the left or right. The section chief checks everything. Then the assistant gunner pulls the lanyard and it's "on the way." As an artilleryman rises in position he can expect promotion in rank also. Gun bunnies usually start as privates first class. By the time a man is setting fuses or number one man he can expect to be Specialist 4. Most gunners and assistant gunners are E-5's. So, as Automatic Eighth gun bunnies pick up the tricks of their trade, the big guns loom before them with promise of promotion and advancement. DEAR SGT CERTAIN: We're out of Cambodia now. Do you think we'll ever return there? DEAR SPEC: I doubt it, but there's murmuring among the command sergeants major that they want to go back for a police call. DEAR SGT CERTAIN: I have noticed some large bugs that look like crickets gathering wherever there is a light in the evening. I have never seen a bug so big. What do the Vietnamese do with them. DEAR WONDERING: For an answer I went to Mama-San. She said that in the beginning of the rainy season they are big enough for you to eat them. By the end of the rainy season they are big enough to eat you. CHIPHU, Cambodia - U.S. forces recently returned an 18-year-old woman to her home in Cambodia after treating her at their medical facilities and probably saving her life. Mrs. Ninh Yan was one of almost 50 Cambodians evacuated by 25th Division troops and treated at American hospitals during operations in Communist sanctuaries. She had been wounded as she and her family walked across a field and were caught in a firefight. "She was a very cooperative patient even though we had a language barrier at first," said Captain Diana Kerns, of Fairmont, W. Va., one of the nurses who cared for Ninh. "All the Cambodian patients were very cooperative. "They really tried to help. They seemed to appreciate everything we did for them," she added. The Cambodian patients were treated at the 12th Evacuation Hospital and the 45th Surgical Hospital or turned over to Vietnamese hospitals. 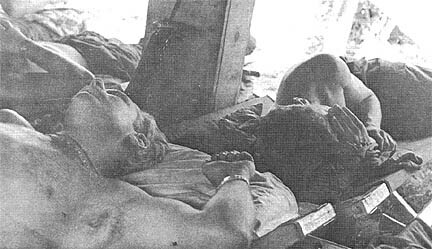 "Many of the Cambodian patients have been returned to their homes through the GVN (Government of the Republic of Vietnam) refugee centers or through the units which originally brought them in," said Captain A. Marc Christianson, Civil Affairs Officer for the 25th Division. "They got the same treatment we give our own GIs," Christenson added. Ninh had been wounded in the leg and stomach. She probably would have died without treatment, according to her doctors. "She was very tolerant of pain. When she was able to get up she would help other patients. 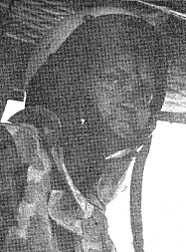 She always smiled and seldom complained even though hers were particularly painful injuries," Captain Kerns said. 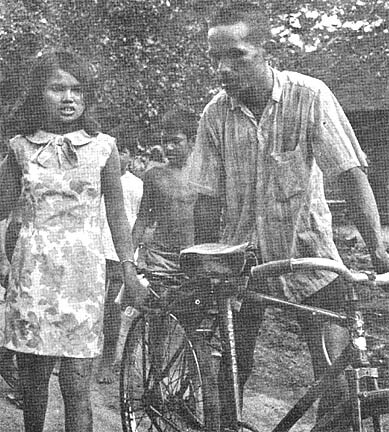 Shortly before Ninh returned to her home, she was given a gift as were most of the other Cambodian patients. The money is given in accordance with oriental custom as "an expression of our sympathy," said Christenson. 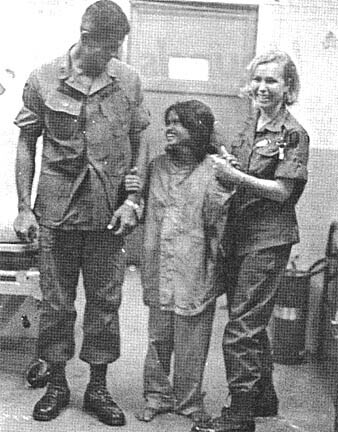 After 52 days in the hospital at Cu Chi, Ninh boarded a 25th Division chopper with an interpreter and Christenson and was flown to her village. There she was met by her brother and an aunt. She learned that seven members of her family had been killed in the fighting in that section of Cambodia. But she knew that the Americans had tried to help her. She gave the interpreter and Christianson gifts before they returned to Cu Chi. "If ever you can visit me again, you will be welcomed," she told the interpreter. Helping wounded Cambodians regain full use of their bodies was part of the contribution of 25th Division medical facilities. 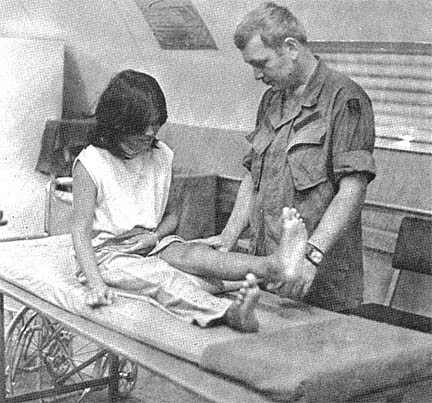 Here Specialist 4 Francis A. Ramella helps Ninh excercise her wounded leg. The day came. She climbed aboard a chopper for home. Ninh had to learn to walk again after weeks in 12th Evacuation Hospital. Here 1st Lieutenant Juoi Tracy and Civil Affairs Officer Captain A. Marc Christianson help her practice. Ninh Yan was one of almost 50 Cambodian civilians who were treated by 25th Division medical facilities during operations there. Ninh was met by her brother. He led her to her new home after she returned from Vietnam. CU CHI - "It was a delicate operation. Whenever you send troops into an area where there are innocent civilians and suspected VC hiding places, you really have to be careful," said Captain David Howery, of Columbus, Ga.
Howery, Commander of Bravo Company, 2nd Battalion, 27th Infantry "Wolfhounds," was talking about the recent cordon and search of Bau Dieu Hamlet, three miles northwest of here. Complaints from the Vietnamese people, combined with the recent assassination of the hamlet chief provoked the plan for the mission. "We heard from the RFs (Regional Forces) that many of the villagers had spotted several VC suspects in the area. After talking with the RFs and PFs (Popular Forces), it was decided that a combined operation was the best way to help the villagers," added Howery. The Wolfhounds moved Alfa and Bravo companies into holding positions late in the afternoon. After nightfall, the Hounds began moving toward their blocking positions. "We were about 1,000 yards away from our positions when we heard the RFs open up. After we heard the contact, we moved rapidly into our blocking positions to prevent enemy from entering or leaving the hamlet," explained Specialist 4 Dean Lowman, a Wolfhound medic from Atlanta, Ga.
"It was near dawn when we killed a VC trying to slip through out lines," Alfa Company platoon sergeant, Staff Sergeant Dennis Stultz, from Hagerstown, Md., said. "Soon after sun-up, the RFs entered the hamlet in search of more VC," added Stultz. DAU TIENG - A road sweep team captured two frustrated Viet Cong soldiers during a recent operation near here. "We were almost on top of two Viet Cong before we spotted them coming out of the woods," recalled a soldier from Alfa Company, 2nd Battalion, 14th Infantry. "Without any hesitation, they threw up their arms and shouted 'Chieu Hoi'." Later, at Dau Tieng, they were questioned by Intelligence personnel. ARVN Staff Sergeant Huynh Tau Buu, an interpreter, spoke in a friendly manner to put the two bewildered ralliers at ease. "At first, neither one would speak," he said "but my interpreter kept talking and joking with them. We gave them a good meal, and one indicated that his wife lived in a nearby village. It was quite a happy reunion when we brought her to him." "After that," Edwards continued, "the rallier began to talk freely. He told us they had just come from Cambodia in an unsuccessful attempt to get rice and supplies, evidently because of the recent allied operation there. CU CHI - Reports have circulated recently that a bunch of "Maniacs" have taken over the Triple Deuce armored personnel carriers. The "Maniacs", however, are actually the mechanics of the 2nd Battalion (Mech), 22nd Infantry. When "Triple Deuce" tracks return from the field the mechanics work around-the-clock repairing and replacing damage. "The biggest problems our APCs run into out there are enemy mines and rocket propelled grenades," said Chief Warrent Officer Billy Shambilin of Charleston, W. Va., battalion motor officer. The repair jobs start with the company mechanics who keep the tracks going during combat operations until the APCs can reach battalion mechanics for more thorough maintenance. "Changing road wheels, shock absorbers, wheel seals and bearings are just a few of the minor repairs done by the company mechanics," added Shambilin. 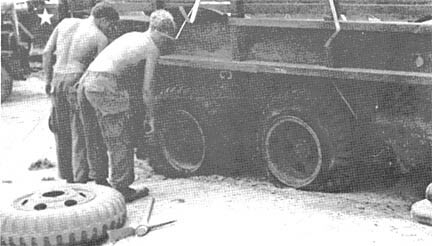 After receiving a damaged track, battalion mechanics inspect and determine the cause of the trouble. Working with the 725th Maintenance Battalion, further inspection is given to double check the cause. Once the APC has cleared 725th Maintenance, the Triple Deuce mechanics go to work. "Electrical wiring, charging systems and engine trouble are our biggest problem," said Specialist 4 Jim Ruckas of Omaha, Neb. "We can pull out a worn engine or blown pack within an hour," said Specialist 4 John Mehling, of Evensville, Ind., a battalion mechanic. "Our nickname, the Maniacs, comes from the fact that we work so fast it seems like we're going mad. Actually, however, we use TLC (tender loving care) on all the machines," smiled Mehling. "Make do with what you have," said another mechanic. With the massive repairs and replacements of parts required during the two month operation in Cambodia, parts and tools became a luxury. CU CHI AIRFIELD - TLN: Pardon me, sir, I'd like to know when the next fixed-wing leaves for Bien Hoa. CPT: (Captain Leonard Bucklin, commander, OL-4, 5th Weather Squadron): Specialist, you're about the one millionth person to come in here asking for flight information! This isn't the passenger terminal, that's the next building down. TLN: Oh, I'm sorry, sir. What is this place anyhow? CPT: This is the Cu Chi Air Weather Station. TLN: Um, I guess that accounts for all the maps and charts on the walls. Looks like a pretty nice set up, air-conditioned and all. CPT: The air-conditioning is primarily to keep our equipment functioning properly, especially the teletype machines. We depend on them for sending out our forecasts and for receiving weather reports from all over the Far East, from Japan to Thailand to Australia. TLN: That's cool. But is that all you have? What about a barometer and a thermometer and stuff like that? CPT: We keep the barometer in here because, otherwise, the heat would ruin it. But the thermometer is outside, of course. TLN: I see. By the way, what's that funny-looking thing out there with the cups spinning around on a pole? CPT: That's an anemometer. It measures wind speed and direction. Together with the barometer (air pressure) and wet and dry bulb thermometer (air temperature) readings, we keep highly accurate statistics. We take these stats and combine them with information from the Army's Metro Service (Cu chi), chart them into maps and send them out via the teletypes. TLN: Sir, it sounds like your operation here isn't Army. CPT: No indeed, The Air Weather Service, of which we are a part, is an Air Force function. It originally started as a part of the Army Signal Corps in 1870. TLN: Ah, so. Then all you do is forecast the weather for the planes that use the airstrip here. CPT: That's only one of our jobs. We're responsible for forecasting the weather for the entire 25th Infantry Division area of operations, from Long An to Tay Ninh. Units of the 25th, especially flight and engineer units, constantly call us for up-to-the-minute advisories (short briefings) on what effect the weather will have on their operations. TLN: I guess accuracy is pretty important. CPT: Most affirmative. We had to forecast the weather for Cambodia, during the recent operations there. The accuracy involved in predicting the when, the how long and the how much of the monsoon rains was of critical importance for the success of the 25th's efforts there, not to mention the daily operations here in Vietnam. The commanding general is given a detailed briefing every day as to how the weather may affect operations. This requires a great deal of accuracy. TLN: I can imagine, sir. But I was wondering, why does the weather here differ so much from the United States? CPT: Southeast Asia is greatly affected by nearby large bodies of water, the Pacific and Indian Oceans and the South China Sea. Prevailing winds that blow over them bring moist air over the land. This is not as evident in the U.S. where different air masses such as cold fronts and warm fronts affect it. TLN: Very interesting. One other thing, sir. How do you make a forecast? CPT: Well, I could get technical and mention dew points, millibars, flows and densities and so forth. But suffice it to say that we try to determine which air currents have a direct effect on our AO, then combine this with the data from our instruments, plot this on altitude levels ranging from 2,000 to 24,000 feet, and this gives us a sounding. This atmospheric sounding enables us to predict thunderstorms, temperature extremes, etc. We call it "tropical meteorology."